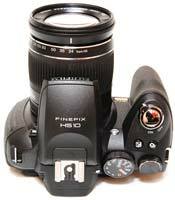 The Fujifilm FinePix HS10 is a new super-zoom digital compact camera with a long list of headline-grabbing features. Looking and handling like a DSLR, the bridge-style Fujifilm HS10 is one of only two digital cameras in the world to boast a 30x zoom lens (the other one being the Olympus SP-800UZ, which we recently reviewed). On the HS10, the lens covers a 35mm equivalent focal range of 24-720mm and also features mechanical image stabilisation and twist-barrel manual zoom and focusing controls. Other highlights of the camera include a 10 megapixel back-illuminated sensor, a 3-inch tilting LCD monitor, electronic viewfinder with eye-sensor for automatic switching, full 1080p HD movie recording with stereo sound, Super High Speed movie capture at 1000 fps, high-speed continuous shooting at 10fps, full manual controls and support for the RAW file format. 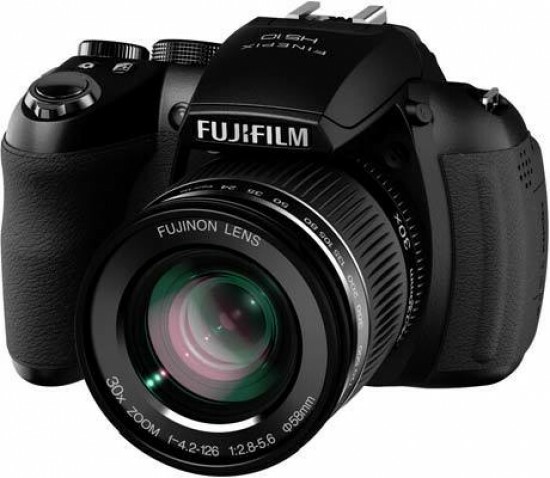 The Fujifilm FinePix HS10 is available at the manufacturer's suggested retail price of £439.99 / $499.95 in the UK / US, respectively. Offering itself as a jack-of-all-trades solution to the serious photo enthusiast, the Fujifilm FinePix HS10 looks, feels and handles very much like a mid-range DSLR, with a weight and solid build quality that should withstand a few glancing knocks in the heat of the action. The moulded curves of the body and matt black finish deliver a purposeful look that is as aesthetically pleasing as it is practical, with nice chunky controls, an ergonomic control layout that allows both quick and easy access to functions, and a deep hand-grip with a well-thought-out indentation into which a middle finger slots comfortably – this is a camera for which you will very much need to use both hands at once. At the heart of the HS10 is the frankly incredible non-interchangeable 30x zoom lens, complete with manual zoom and focus rings, just like on a DSLR lens. This incredibly versatile lens offers a focal range starting at an ultra-wide 24mm and finishing at an ultra-telephoto 720mm, which, as Fujifilm cannily point out, would take at least two super-zoom DSLR lenses to offer similar reach. Throw in the 1cm Super Macro Mode and impressive maximum apertures of a bright f/2.8 at 24mm wide-angle to f5.8 at 720mm telephoto, and it's clear that the HS10 is perfectly suited for any subject that you can think of, near or far. To help avoid blur resulting from camera shake when shooting in low light or hand-holding the camera at the telephoto extremity of the zoom, Fujifilm have added a 'belt and braces' solution of high ISO sensitivity, stretching up to ISO 6400 at full resolution, a built-in mechanical stabilizer with Continuous or Shooting Only modes, and digital image stabilisation too if required. Activated via the IS Mode menu option, you can set the system to Continuous, Shooting Only, either mode with the addition of digital stabilisation, or Off. Note that the camera will only automatically adjust the ISO speed when using the Auto shooting mode - in the other modes the ISO speed that you select will always be used, so only the mechanical CCD-shift part of the system is used. Unlike some rivals, the full 30x zoom range also be accessed in the Motion JPEG format movie mode, with the HS10 offering full 1920x1080 pixel footage at 30 frames per second with constantly adjusting auto exposure and focus with stereo sound. There are still very few digital compacts that offer 1080p video recording, so the HS10 is a definite camera to consider if movies are your thing. It can record video clips up to 29 minutes long for the 1920x1080 and 1280x720 pixel formats, with longer times available for VGA and SVGA modes. The dedicated Movie button on the rear makes it quick and easy to shoot a movie without missing the start of the action, and there's a mini-HDMI port for connection to a HDTV (cable not supplied). In addition to these "normal" movie modes, the HS10 also offers several high-speed modes, a feature that was pioneered by Casio last year. There are five different speeds on offer - 1000, 480, 240, 120 and 60fps, with the file size varying from 224x64 to 1280x720 pixels respectively. This extreme slow-motion effect is initially very appealing and sure to impress your friends, but there are some drawbacks to be aware of. Sound isn't recorded at all, horizontal bands can appear as the lighting fluctuates, and the actual sizes of the recorded movies are pretty small, especially the 224x64 pixel, 1000fps mode. From the front the Fujifilm HS10 looks like a serious bit of kit, and indeed requires a degree of familiarization with the manual to get the best from. 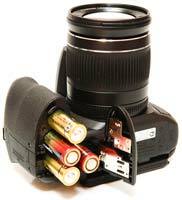 The large optically stabilised zoom lens dominates proceedings, with a clip-on lens cap and strap provided in the box. Above the lens and extending out across the lens barrel, which boasts a textured surround allowing you to get a good firm grip and achieve a smooth, steady zooming action, is an attractively sloping ridge that conceals the pop up flash (when not in use), which is activated via a dedicated button positioned on the right. Still viewing the HS10 from the front, the stereo sound speakers are positioned one on either side of the lens barrel, with a the familiar dual purpose AF-assist illuminator and self-timer lamp to the left. Above the pop-up flash is another DSLR-like touch - a hotshoe for additional illumination via an optional external flashgun. Looking down on top of the camera, viewed from the rear, there's a clearly labeled and logically laid out control set, with a chunky, ridged shooting mode dial which is reminiscent of those found on, yes you've guessed it, DSLR cameras. Ranged around the dial, which turns with just the right amount of resistance for it to lock firmly into place at each setting, are the expected shooting options, such as full auto, program, shutter priority, aperture priority and manual modes, along with a customizable mode via which favoured shooting settings can be saved for rapid access, plus two scene position modes (SP1 and SP2) pre-optimised for common subjects. In addition, there are three more shooting modes that are particularly noteworthy. First up is the SR Auto mode, an 'auto everything' scene recognition mode that's the equivalent of Panasonic's Intelligent Auto mode. Although far from infallible - if you're not paying close attention and it's presented with a busy scene it will call up landscape when macro is needed and vice versa – it instantly makes the HS10 more beginner friendly. Next is the rather misleadingly named Advanced mode, which actually has three options that are well suited to all experience levels. The Pro Low-light mode uses multi-bracketing technology, taking a series of four high sensitivity/low-noise shots in quick succession and combining them into an image with less noise than the single exposures. You can see examples of this shooting mode on the Image Quality page. Multi Motion Capture uses the same bracketing innovation to take up to 5 images of a moving subject and combine them into one composite image with multiple views of the subject. Conversely, Motion Remover takes up to 5 images, identifies anything that is moving, and produces one shot with all those subjects removed, ideal for tourist-free shots of famous landmarks. The third shooting mode is the new Panorama option, clearly inspired by Sony's popular Sweep Panorama function. This lets you capture a panoramic image very easily without the use of a tripod. All you need to decide is whether you would like to start from left or right, top or bottom, then press and hold down the shutter release while doing a "sweep" with the camera in hand. Exposure compensation is available before you start the sweep, with the exposure fixed once you depress the shutter button. After you are done with the sweeping, the camera does all the processing required, and presents you with a finished panoramic image. Although undoubtedly fun, there are a few catches. The final panorama is of relatively low resolution: the shorter side is invariably 720 pixels, whereas the longer side is 5760 pixels. Note also that if you do the sweeping too slowly, or you let go of the shutter release button too early, the panorama will be truncated. If the exposure varies throughout the scene, the some areas will be over or under exposed, depending upon the exposure value that was chosen as the panorama was started. Finally, people and indeed anything that moves in the frame are recorded as several ghost outlines, which means that you can really only record static, empty scenes, something that Sony have solved in the latest iteration of their Sweep Panorama feature. results. It's an effective automatic way of taking photos of children indoors, for example. In the similarly named Natural Light and Flash mode the camera instantly takes 2 photos, one with flash, one without, giving you the option of which one to choose later (both are saved by the camera). Intelligent Flash is a rather grandiose sounding feature that is a little more specialised that its name suggests. It essentially throttles down the flash when taking macro shots, so that the subject isn't over-exposed by a blinding white light. Integrated into the Auto shooting mode, in practice it does produce quite effective close up shots that don't suffer from over-exposure, and which exhibit much less camera-shake when you're shooting hand-held (although ideally you should use a tripod for ultimate sharpness). To the right of the shooting mode dial is a smaller command dial with a positive clicking action which is used for scrolling through features and captured images, and will feel immediately intuitive to anyone who has handled a DSLR before. 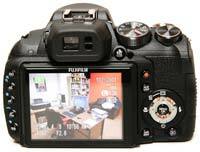 The same dial is also used to change the aperture and shutter speed when using the more advanced shooting modes. In the Manual mode, you hold the Exposure Compensation button down with your forefinger and give the dial a flick with your thumb to change the aperture, not as intuitive as having two separate command dials but perhaps understandable given the intended user. Otherwise the exposure compensation button works largely as you'd expect, with a visual slider graph on screen accompanied by a live histogram, a dual touch that is both unusual yet welcome. Next to the EV button is the rather innocent-looking Continuous Shooting button, which accesses another of the HS10's mouth-watering features. Pressing this button brings up four options - Off, Top 7, Best Frame Capture and AE Bracketing. Choosing Top 7 or Best Frame Capture and also making sure that High-Speed Shooting is turned on in the main menu allows you to take 10 full-resolution photos at a frankly astounding 10 frames per second, which is faster than most compact cameras and indeed most DSLRs too. The only flies in the ointment are that only 7 JPEG images or 6 RAW images out of the 10 are actually saved to the memory card, with Top 7 saving the first 7 and Best Frame Capture taking images from the moment that you focus and then saving up to 7 frames either before or after you press the shutter button. Once the burst is completed, it takes over fifteen seconds for the camera to clear the buffer, during which you cannot take another picture. There are also three other continuous shooting speeds where the Fujifilm HS10 shoots at slower speeds of 7, 5 or 3 frames per second. Forward of these two controls is the main shutter release button encircled by an on/off power switch. Flick this to On, and the rear LCD or electronic viewfinder – depending on which one you previously had selected – blinks into life, a process taking around two seconds, which for once is not quite as good as most DSLRs. 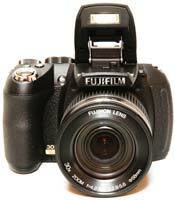 Still, the Fujifilm FinePix S100FS is very fast to determine focus and exposure with a half press of the shutter button. Although JPEGs are quickly committed to memory in single-shot mode with only the briefest pause between each one, unfortunately there's a noticeable 3 second delay between the capture of one RAW file and the next during which you can't take another picture, which rather slows down the shooting experience unless you stick to the JPEG format. JPEG or RAW images are committed to SD and SDHC cards (xD-Picture Cards are no longer supported) although there's no card supplied out of the box, with just the 25MB internal capacity to fall back on. Moving to the rear of the HS10, your attention is immediately drawn to the large 3-inch monitor, which offers 97% scene coverage and a rather disappointingly average resolution of 230K dots. The HS10's g LCD can be moved 90° upwards and 45° downwards to get your shot or aid visibility, but unlike some other cameras it can't be pivoted left nor right, or indeed turned so the screen is protected face-into the body when not in use. While some may debate whether an adjustable LCD is an essential feature or a sales gimmick, once you get used to using one it's something you find yourself missing when it's not there, proving particularly useful when holding the camera above your head or as a waist-level finder for more candid shots. 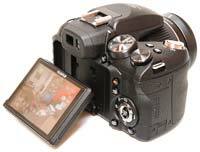 To the right of the LCD is a small button for swapping the display between monitor and the 200k-dot resolution electronic viewfinder with 97% scene coverage and surrounding eyecup. The EVF also has its own dioptric correction wheel to its immediate left, which is far less stiff and physically larger than found on competing models, meaning that for the myopic adjustment can be made in a faction of a second. The viewfinder display is itself large, bright and clear, though the temptation to predominantly utilise the more flexible LCD below is almost overwhelming. A welcome addition comes in the form of a sensor which automatically switches between the EVF and viewfinder when you hold the camera up to eye-level, speeding up the transfer from using the LCD to taking a shot through the EVF. Note that his feature can be turned off if you find it annoying. To the left of the LCD screen is a vertical column of five small buttons which provide direct access to most of the HS10's key controls, once again mimicking the control layout of several entry-level DSLR cameras. Starting from the top, there are buttons for choosing the ISO speed, metering (multi pattern, spot or average), AF mode (center, multi, area or tracking), AF type (continuous, single shot or manual), and the White Balance. All five buttons also perform actions during image playback, denoted by the blue symbols. To the right of the screen is the previously mentioned one-touch movie record button and a self-explanatory AE/AF lock button. Below is a familiar four-way controller with a dual-purpose menu/OK button at its centre. Ranged at north, south, east and west around this control are variously, a means of selecting the focus point (doubling up as a file deletion button when in playback mode), the various flash modes on offer, the self timer options, and shifting focus from infinity to either macro or super macro. Press the Menu button in shooting mode and you get a comprehensive choice of options from two main folders., Shooting and Set-Up, with up to 6 screens containing 6 icons per screen. Most of the options are the "set once and forget" kind, so you won't have to dip into the menu system too often. Below the navigation pad is a dual-purpose control marked Display/Back that switches between the various LCD modes and also allows you to retrace your steps at any point. Completing the rear of the HS10 is a self-explanatory playback button for quickly retrieving captured images. The right hand flank of the Fujifilm FinePix HS10 features a flip-open compartment for the SD / SDHC card slot, while the left has a rubber flap hiding the HS10's mini-HDMI port and the regular USB / AV out socket, plus the camera's built-in speaker. The base of the Fujifilm FinePix HS10 features a screw thread for a tripod, sadly made of plastic and not in line with the lens barrel, and a sliding door hiding the compartment for the four AA batteries stored within the handgrip. Battery life varies from poor with the supplied alkaline batteries to very good with a decent set of Ni-Mh rechargeables, easily obtaining over 500 shots on one charge. There are metal loops either side of the body for attaching the provided strap.